Despite Ukraine, both countries want a deal that could further the global energy rebalance. Despite Russia’s worsening relationship with Western Europe and the U.S. over the Ukrainian crisis, its ties with Japan have tended to be more flexible, even as Tokyo has followed its Western allies by imposing sanctions on Moscow. It was confirmed last week that President Vladimir Putin will meet with Prime Minister Shinzo Abe on the sidelines of the APEC Summit in Beijing next month. Now, it appears an agenda for those talks may be forming. The plan has been dormant since late spring, just after China signed a similar massive pipeline deal with Russia. Despite the escalating conflict between Russia and Ukraine at the time, as late as May 23 a group of 33 Japanese lawmakers were lobbying the Abe administration to push the pipeline in talks with Putin in Tokyo scheduled for this fall, which were later cancelled. Russia already supplies 9.8 percent of Japan’s LNG imports. The proposed pipeline would deliver 20 billion cubic meters of natural gas every year, which at full capacity would supply 17 percent of Japan’s total natural gas imports. 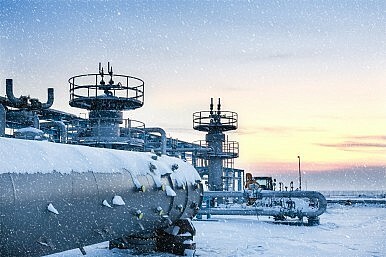 As an additional bonus, using a pipeline does not require the building of expensive regasification plants, and natural gas from Russia would probably still be cheaper, as prices for the prospective Russia-China pipeline are expected to be $10.50 to $11.00 per million British thermal units (BTUs), while Japan’s LNG import price was $13.05 BTUs on October 10. While Japan is still careful to caveat cooperation with Russia, contingent upon how the situation in Ukraine unfolds, the crisis does not appear to be an arresting factor in its current form, especially as Tokyo’s Western allies become preoccupied with the heightening conflict with IS in Iraq and Syria. Particularly for the U.S., if Ukraine continues to be a second-tier problem, Japan may find enough space to continue negotiations with Russia over the proposed pipeline. An Abe-Putin meeting on the sidelines of the UNGA again raised hopes for a peace treaty between Japan and Russia.